Easter is what you make of it. Over a lifetime you collect memories of Easter, many of them with friends and family. They may or may not included costumes, swords, pirates and/or stringing cables for masquerades. As a child abroad, there were special moments such as the giant, to a seven-year-old, solid chocolate rabbit that my mother got from a White Russian woman who sold them in Hong Kong. Another year I discovered the truth about the Easter Bunny when its helpers overslept, and the basket was empty. I remember hunting colored eggs with my friends. One of them later was murdered during hitchhiking in the 1970s. I still have a picture of her at the hunt though, so she lives forever. As a teenager, my high school friends started the science fiction group, and were also theater people. Instead of going to church, we went to the local SF convention, Balticon, which coincided with Easter. At those early conventions in the 1970s, things were simple. You could toss a cape over your arm, pretend you were King Arthur, and be generally accepted. You could also learn to sew, figure out how to make a gown, and pretend you were out of a Tolkien book or Roger Zelezny’s “Amber” series or whoever you were reading. Everyone spoke the universal language of SF and/or fantasy literature. One memory from the 1980s is of seeing the young girls in their frocks and flowers dancing down the hallway of the Hunt Valley Inn while on the other side chain mail clad barbarians carrying axes and looking totally exhausted went by. Both sides were happy. This was decades before “Game of Thrones” made fur cloaks and swords popular in the mainstream. Conventions was often the only time I saw so many friends who enriched my life to this day. The convention moved Balticon to Memorial Day and another hotel, and I stopped going. It took another twenty years and a career in journalism to manage to spark another Easter memory. 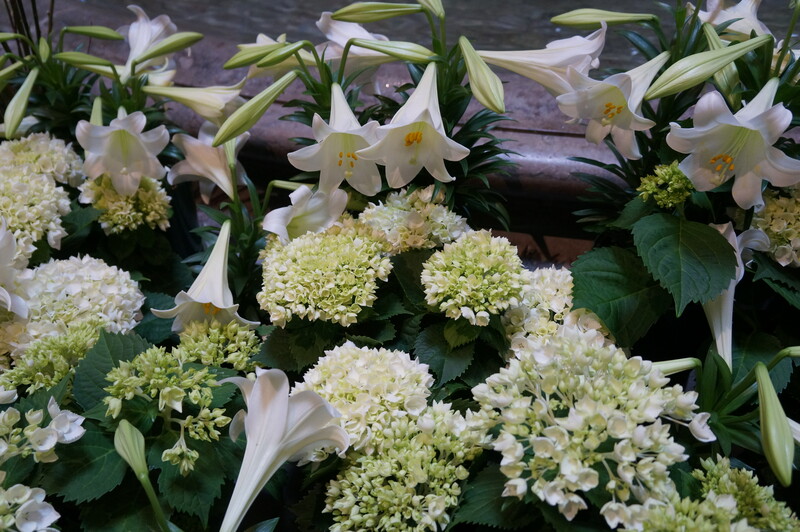 In 2014, the McClatchy newswire allowed me to do an article and a video on the Easter lilies of the National Gallery of Art. During the winter the NGA has an inside garden. After Easter, the fountain with mercury is barren until fall. Here’s the Changing of the Lilies. 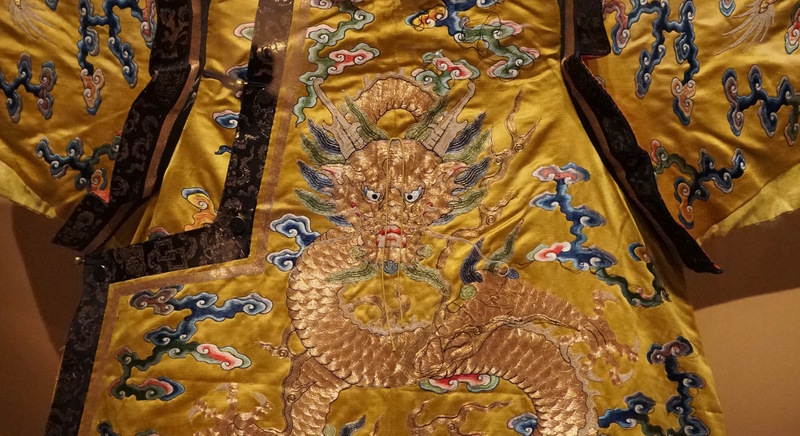 An Imperial dragon robe made in the mid-1700s of silk and metallic-wrapped threads. “The only person the Emperor would bow to is his mother,” says Jan Stuart, the Melvin R. Seiden Curator of Chinese Art at the Freer Gallery of Art. 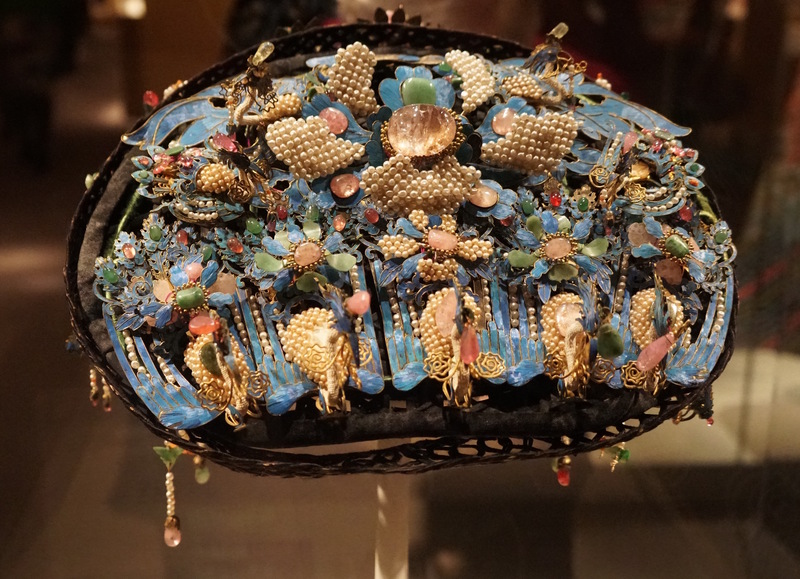 Along with co-curator Daisy Yiyou Wang of the Peabody Essex Museum in Salem, Massachusetts, Stuart spent over four years working with the Palace Museum in Beijing to bring intimate items of the elite women to the new exhibit, “Empresses of China’s Forbidden City, 1644-1912.” They give insight into the opulent, but restricted, lives of the mothers, wives, and consorts of the Ching dynasty. Opening March 30th at the Arthur M. Sackler Gallery in D.C., the exhibit is timely as this is the 40th anniversary of the resumption of relations between China and U.S. “Empresses” runs through June 23rd, 2019. Women’s stories are not a large part of Chinese history unless associated with a man whose life was well chronicled. 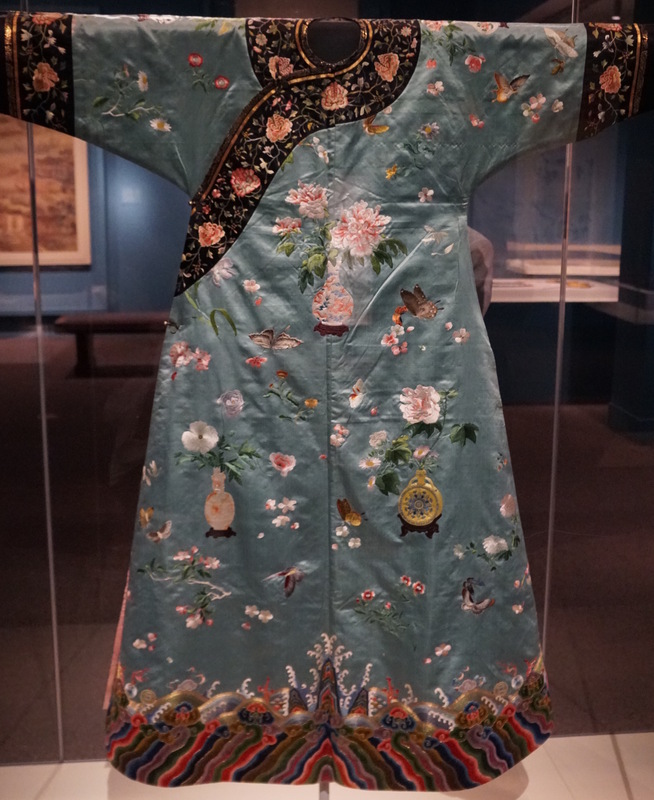 “Empresses” chose to center on five different Empresses who affected or ruled the vast Chinese empire. They’re remember as Xiaozhuang, Chonquin, Xiaoxian, Ci’an and Cixi. In 1644, the northern nomadic Manchu tribes overthrew the Ming dynasty. 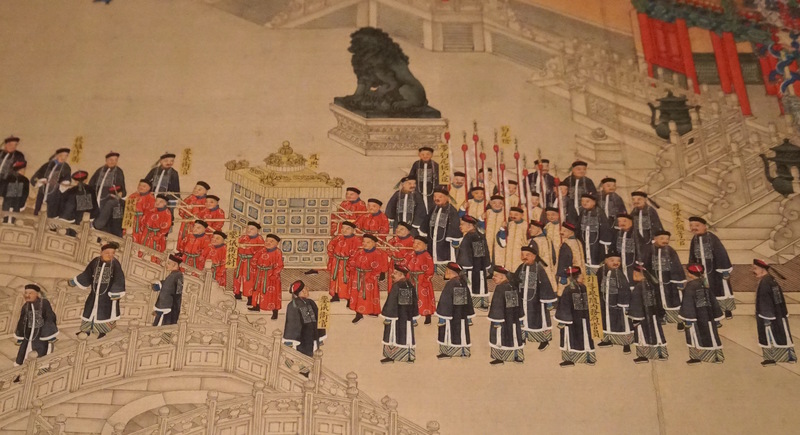 The Ching dynasty set up their capital in Beijing and ruled until the 20th century. While an Emperor could have many wives as he liked in his eight ranks of consorts, there was only ever one Empress at a time. They all came from the Manchu elite. The first, Empress Xiaozhuang (1613-1688), helped promote the Tibetan Buddhism within China. One of the ways to rise amid the ranks was to provide the Emperor a son. The Empress Dowager Chongquin (1693-1777) was a palace servant who had a boy who became emperor. He adored and respected her to the end of her days – and beyond. The 15-year-old Emperor married his childhood sweetheart, the Empress Xiaoxian (1712-1748.) After she died at 36, her husband wrote a long poem about his lasting sorrow at her loss. While he had other wives, none ever took her place in his heart. The last two Empresses were a collaboration of generations. Childless Empress Dowager Ci’an (1837-1881) helped raise a boy born to a lower level consort, named Cixi. They served as co-regents until Ci’an died. Cixi was the de-facto ruler through the next generations of emperors. Empress Dowager Cixi (1835-1908) is probably best known Chinese empress known to the West through her encounters with the British and the Americans. She reigned until 1908. 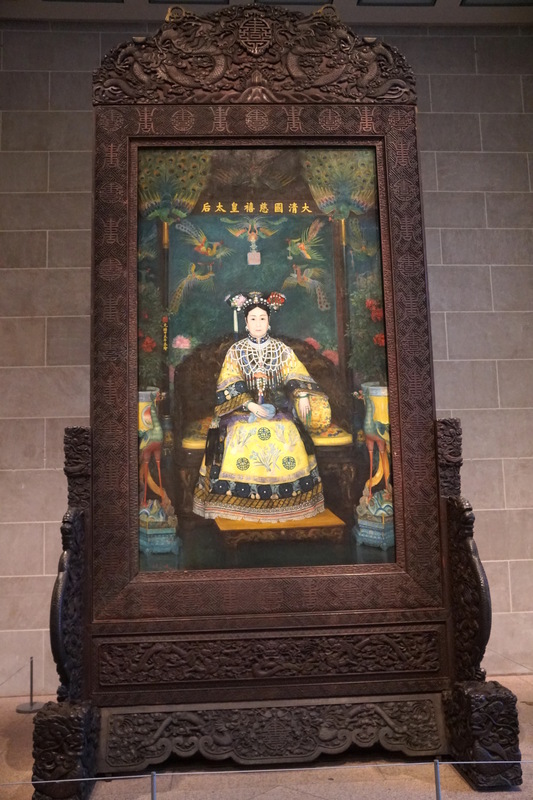 It is Cixi who dominates the exhibit since her long reign stretched into the 20th century. Entering the exhibit, you see a huge portrait in a camphor wood frame. Painted by an American woman, Katharine A. Carl, it was exhibited at the 1904 St. Louis World Fair. The painting was later given to President Theodore Roosevelt. The exhibit’s last image, of Cixi, is from a glass negative photograph from the Freer collection. The Ching Dynasty was overthrown in 1911 with the last Emperor, Puyi, abdicating in 1912. The items on display all tell more than one story. 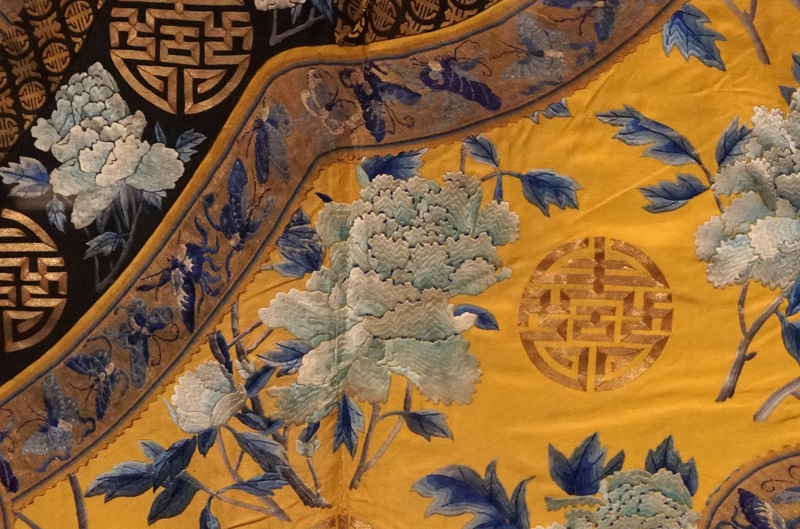 Embroidered birds, butterflies, dragons and other details all have deeper meanings in Chinese symbolism. The phoenix is the king of birds and a symbol of the Empress. The peony is “king of flowers” said Stuart, meaning royalty among other things. Everyone knew their place at the Ching court. Their clothing showed exactly what their rank and importance. 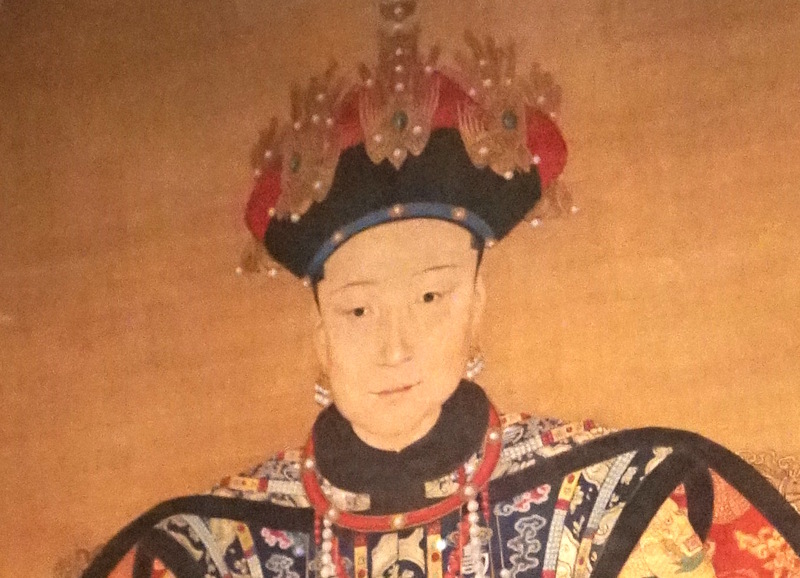 The ancestor painting of Empress Xiaoxian shows her dressed in imperial robes and a phoenix-adorned headdress. Three sets of pearl earrings dangle from her ears as a symbol of her royal state. Normally women were only permitted to wear one earring in each ear. Empress Cixi knew the power of symbolism. 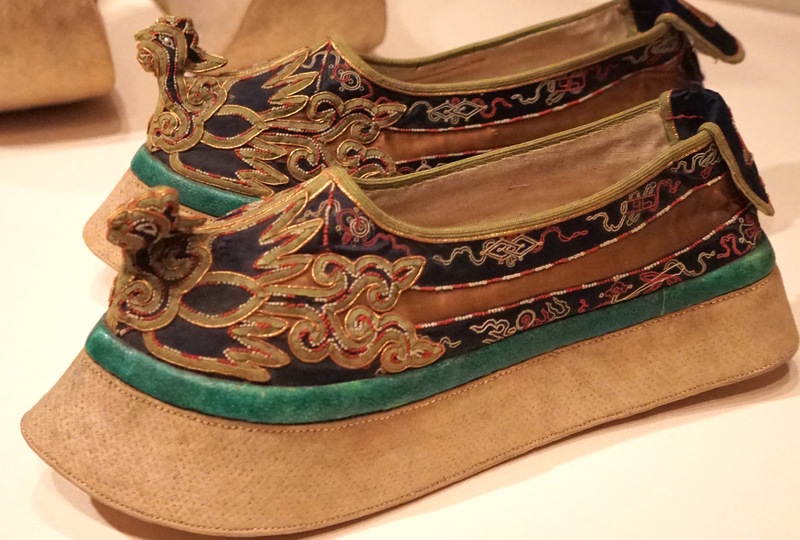 Her platform shoes not only displayed the symbols for longevity but have imperial phoenixes on the tips. In contrast, two hundred years earlier, the Empress Xiaozhuang is dressed in a simple brown robe. Her throne has dragons and phoenixes which indicated a satisfying, happy marriage. Her long sleeves have “horse hoof” style cuffs, mandated for Manchu royalty. The exhibit is not all scrolls and paintings. The athletic Manchus enjoyed hunting. Socks and pair of riding boots from the late 1600s show details not seen in public. The patterns on the white socks are made by peacock feather filaments wound around silk threads. Two stunning hats have vibrant blue kingfisher feathers. One has small vibrating phoenixes with pearls and flowers. 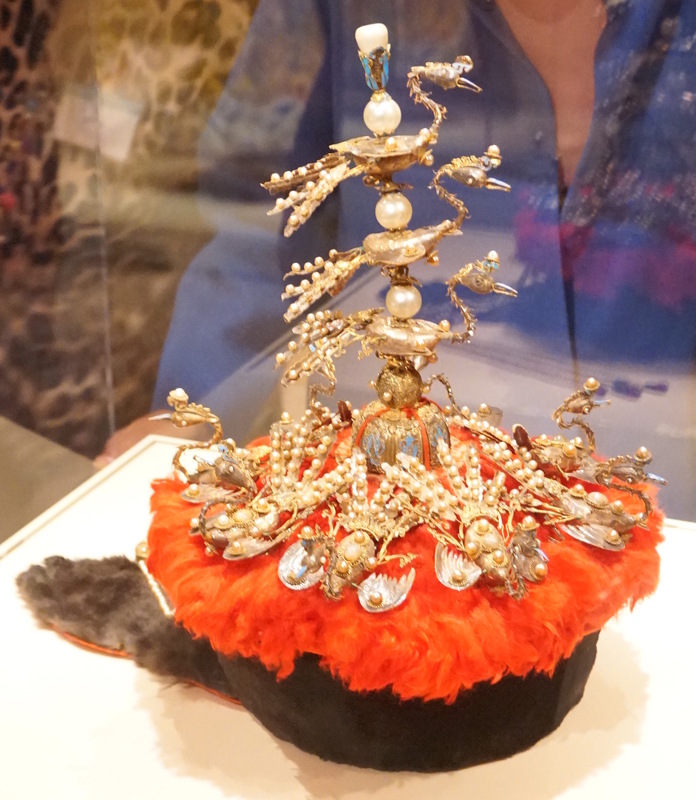 Another hat has sable fur, red feathers and a towering set of metal and pearl phoenixes. The impressive gold dragon seal of the last Empress of China, Xiaoke, was so heavy that it was left behind when she fled the palace in 1922. 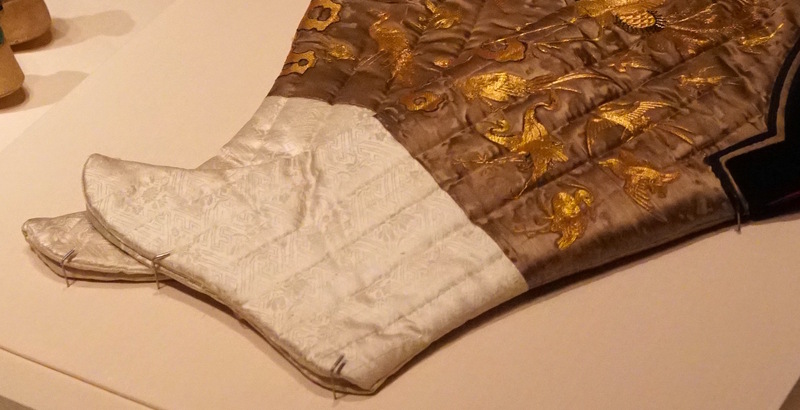 It’s the personal items that humanize the women of the painted scrolls. Cixi had a small massage roller for getting rid of wrinkles. The small black and gold traveling case stands open showing small drawers and an elaborately carved mirror stand. 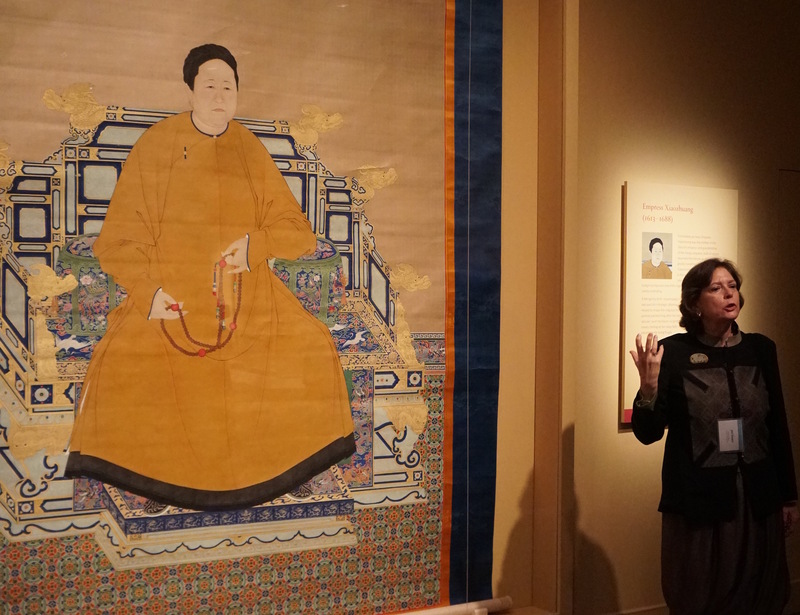 The exhibit’s book, “Empresses of China’s Forbidden City, 1644-1912,” is outstanding. It is worth reading every detail, from the authors’ notes to the captioning. The color plates show clearly what the low-light of the exhibit does not. There is no flash photography allowed. Women are getting their due this year. This is one of three exhibits on the East Coast centering around women. The Metropolitan Museum of Art in New York has an exhibit centering around 1000-year old novel, “The Tale of Genji“. The National Geographic Society has an exhibit of Queens of Egypt. Here’s the Avengers: Endgame Trailer #2. Spoiler: Downbeat. New Captain Marvel ad for film coming out early March. I already have my ticket. Update #24: And that is that. For the first time I was rooting for the Patriots because I didn’t feel the Rams won legit. Good luck for next year. And CBS or NFL? Cut the internal reporters mike feed please? I can hear them being crushed. Update #23: Another T-Mobile text ad. Oh, the Wpost Journalist ad. So proud of having been a journalist, so heartbreaking to see Austin again, #FreeAustinTice, in a video I hadn’t seen before. I am now sniffing. Update #22: Another Michelob ad. (I don’t drink. I have to Google the spelling of all these beer companies to get them right.) Ad proclaiming that young girls might be football players and should have the chance. Blink? Update #21: Okay, I love that Alexa ad. The fountain gets me every time. Worth searching out for a link. And Harrison Ford, 76, still Hot! Update #20: Burger King brings back Andy Warhol? Boy, whose the audience (other than people my age… uh….) who recognized him? Oh, the Budweiser horses with Dylan and “Blowing in the wind” proclaiming the beer’s brewed by wind power. Cute. Update #19: Huge push for inclusion of all kinds of kids with the Microsoft ad. ANOTHER Bud Light medieval corn syrup ad. Oh, why? Don’t care. Oh, wait = the NCGA National Corn famers unhappy with dissing on corn syrup. Whatever. They can put the corn back in ethanol. Second heart-tugger ad on First Responders. Sniff. Update #18: I guess after this year’s bad press (Moonves), CBS is trying to remind you of its greatest hits. Comcast ad on their advances in technology. Update #17: Amazon new series: Hanna looks interesting. New sneakers look cool – Sketchers. More Bud Light ads proclaiming they have no corn syrup. I guess this has become a *thing*. Update #16: Google ad on Military=heart tugging. Very simple. Colgate ad with man-in-your-face? Ugh. Not a good seller for me. Update #15: Devour foods has at least caught my attention. I’ll recognize the name. NFL players supporting kids, Inspire Change. Good ad. Lots of NFL ads tonight. Update #15: Oh, lordie, another T-Mobile ad texting. Sigh. Still not changing my phone. Another tech ad Wix.com. Are we back before the Dot.com bubble burst of 2000? Wix.com . Netflix does nature special Our Planet. Another one for togetherness. Robots depressed because they can’t drink Michelob and humans can. Update #14: KIA Telleride ad is a heart-tugger but why do the water stunt if you have to tell people Not To Do it? Michael Buble for Buble water. Cute. Update #13: Toyota Supra ad to The Who’s Tommy. Little complicated. ADT wants to protect your house. Alicia Keys for the Grammy Awards — okay. Hewlett Packard is out to simplify your IT life by banishing a huge red monster. Ok. Redfin wants to sell your house. Xfinity wants to protect your house. There are many PROTECT YOUR HOME electronically adverts. My take on Halftime? I enjoyed the classic style with more emphasis on the singing and music than Spectacular Performances. Update #12: Okay the NFL 100 ad was fun even if I recognized only 2 of the numerous players. (Here’s the behind the scenes video) Time for Half-time! Update#11: CBS has decided to push all their shows before the half-time show. Local ads. Yellow Tail wine ad playing it safe. Update #10: Turbotax robot is just… weird. Stella Artois with star actors. Seen it before. Sprint ad with bigger robots and a mermaid. Wouldn’t make me change to Sprint. Lebron James & new TV show ad. Update #9: MintMobile with chunky milk takes me back to the ads of the early digital era and all those start-ups that failed. 2001, anyone? Norwegian cruise lines=normal ad. Oh, wow. Young Spock for Star Trek: Discovery. Hotness! Update #8: Toni Harris football player ROCKS for the Toyota Rav-4 upcoming hybrid. Planters automobile cashew was… uh, interesting. Hi Charlie Sheen! Update #7: Mercedes wish-fulfillment ad was notable for the handsome lead. Persil spent a lot on their cleaning ad. Suitable for daytime TV. T-Mobile/Taco Bell text/twitter/ho-hum. Update #6: Just saw the third ad supporting worldwide togetherness, this time from Google. The others: Audi ad with guy meeting grandpa and getting a car while choking on a cashew was poor because you had to wait until the end to find out what it was advertising. Update #5: Game of Thrones meets Bud Light knight. OMG. Dragon flaming. Toasted knight. Update #4: Expensify’s ice cold rap ad was – snort! Giggle! The Rock’s new movie is humor and violence. Hobbs and Shaw. Update #3: The corn syrup/beer ad was really cute. The sparkling water mermaids of Spiked Selzer was fun but having the fish come out behind the tails gave the impression that they were passing gas. Unfortunate. The Doritos ad was uninspiring. Update #2: Turkish Airlines was interesting. Created by film director, Ridley Scott. Personally, I flew that airline and they were wonderful. Update #1 ads: Liked the Serena Williams dominance ad; Hulu’s The Handmaid’s Tale was unnerving which was the point of course. Current ads: Pizza Hut with Lincoln, obnoxious; Coca-Cola, together is kinda cute. 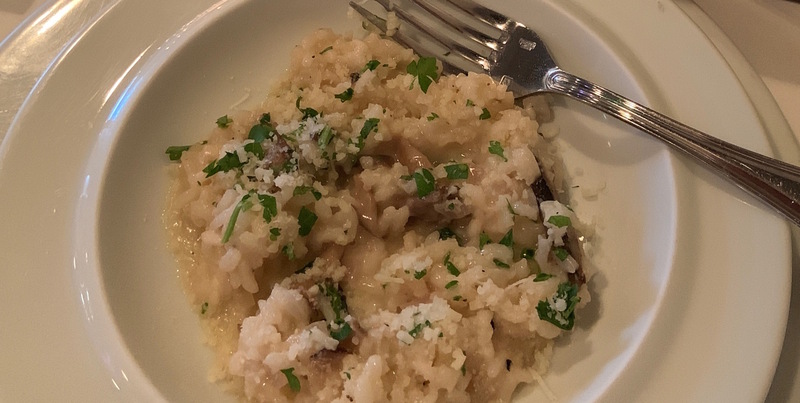 Blogger note: One of my New Year’s Resolutions was to post one blog every month. Here’s February, but who knows what may come next? Maybe two! On the eleventh hour of the eleventh day of the eleventh month, the guns fell silent. 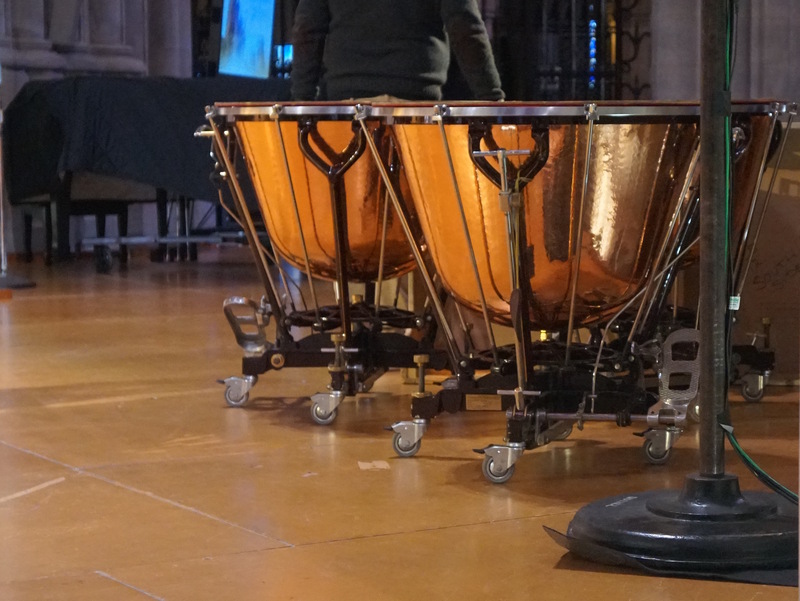 The Veterans Day memorial service for WWI Armistice Day Centennial was held at the Washington National Cathedral started with the boom of drums that sounded like the guns over Verdun or the Somme. Then they fell silent, and the progression of speakers – congressmen, religious leaders, a bagpiper of the UK’s 4th Batt. The Royal Regiment of Scotland, walked by. The Cathedral Choir sat in the rear. The Color Guard Company C, 8th Regiment, U of MD Army ROTC entered. The service began. 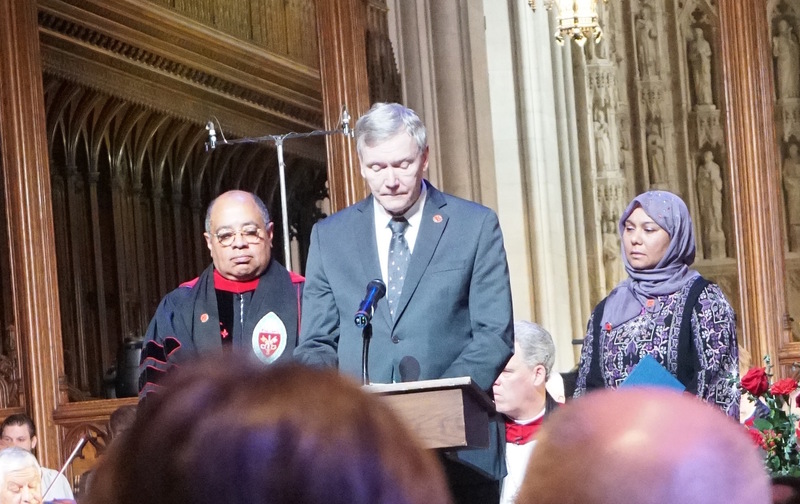 Joyce Kilmer’ “Rouge Bouquet” poetry was read aloud, “In Flanders Field” by John McCrae was read by a frail former Sen. John Warner, 91, and a passage from the Book of Ecclesiasticus 44:1-15. 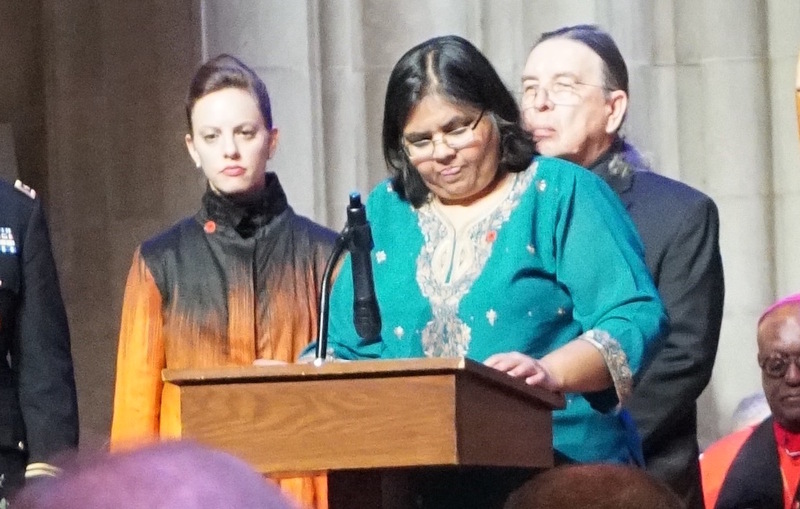 Among the religious speakers were William Aiken (Buddhist), Harvey Pratt, Cheyenne/Arapaho (Native American), Fazia Dean of the Dar Al-Hijrah Islamic Center (Muslim), Leonard L. Hamlin Sr. (Christian) and Susan Sloan (Jewish). All called for Peace in their prayers. During the prayers, I sent thanks to my grand-uncle Donald Chapman who served in World War I, came back safely, and was much loved by my grandmother. After the congregation was dismissed, everyone wandered around in the bright light streaming through the stained glass windows. It was a cold but brilliant sunny day. A lily was laid on the grave of President Woodrow Wilson. 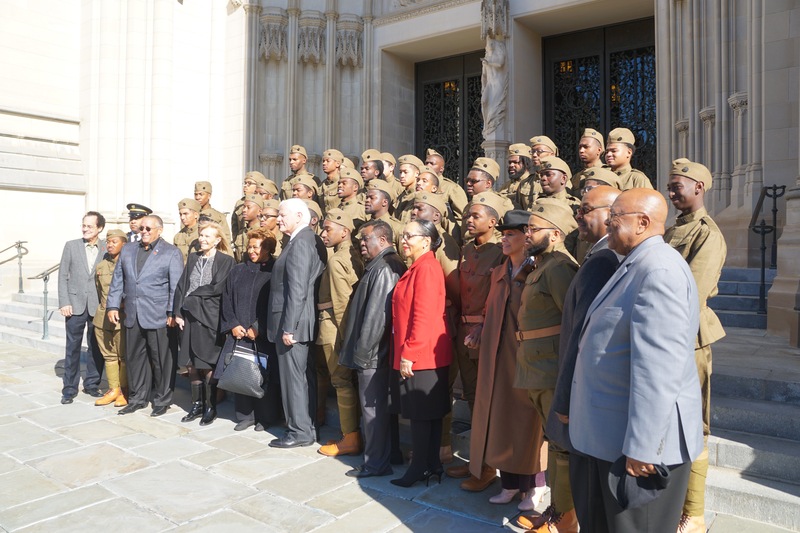 Outside a group of re-enactors from Historically Black Colleges had their pictures taken. I was told that the young men had come from all over the U.S. I took a picture for one trio in their uniforms. 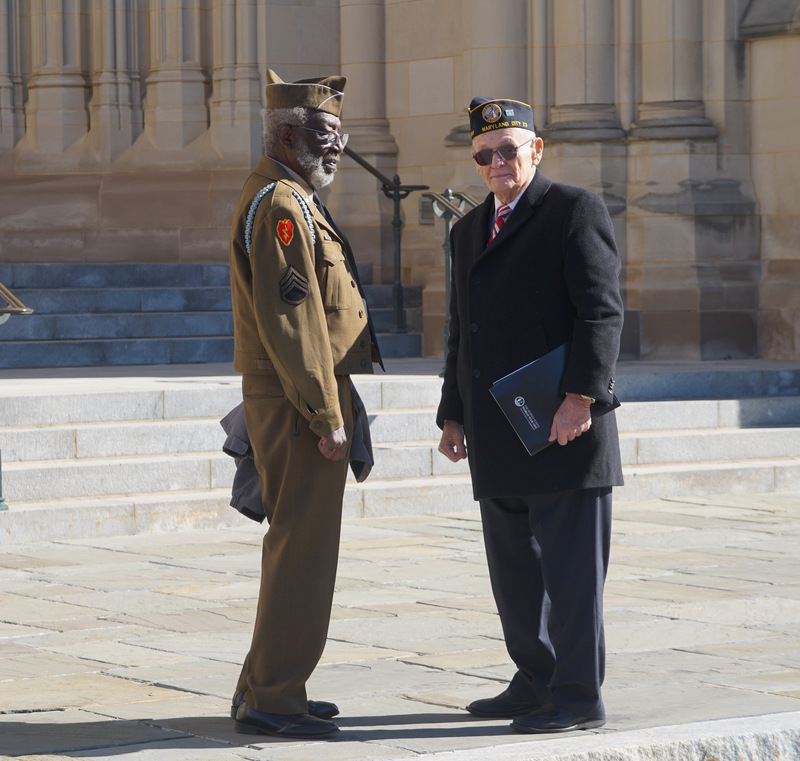 As I was about to leave I saw two veterans talking. The one on the right was 82. It’s Your Universe, You Have The Power To Make It Happen by Ashley Eckstein. 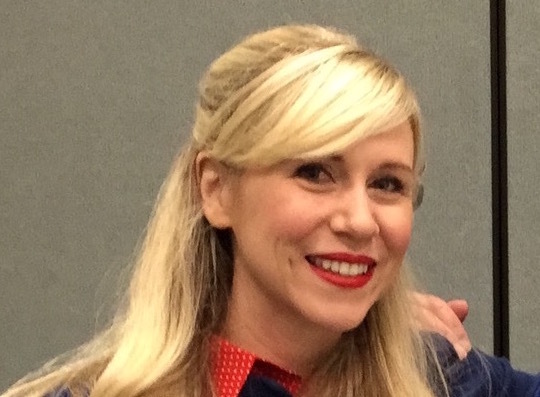 For those unfamiliar with the name, Ashley Eckstein is the actress who voiced the Star Wars animated character Ahsoka Tano on Star Wars: Clones, and in the succeeding series, Star Wars: Rebels. She also created the women’s merchandise brand, Her Universe, aimed at women who enjoy genres such as Marvel, Star Wars, and the Walking Dead. Eckstein wanted to be involved with the Walt Disney Company from a very early age. Her father worked at Walt Disney World when they lived in Orlando. In the beginning, she had ambitions to walk in the Main Street U.S. A. parade. She achieved so much more through hard work. That’s really the point of this book. If you want to make a dream come true, then it will take lots of effort, self-discipline, concentration, and a dollop of luck. Eckstein’s autobiography is aimed at Disney-knowledgeable girls between 7 and 12. Over the years, I interviewed her three times, and wrote about her twice when I was with the McClatchy/Tribune newswire. After roles on some Disney television programs, she decided to add being a voice actor to her resume. After numerous auditions, she was cast as the breakout girl character in the Star Wars: Clones, Ahsoka Tano, who become very popular. Eckstein’s next career step was unexpected. Going out to find some merchandise (think “T-shirts”) to help promote the series, she discovered a wasteland of merchandise for fangirls of the Star Wars saga. 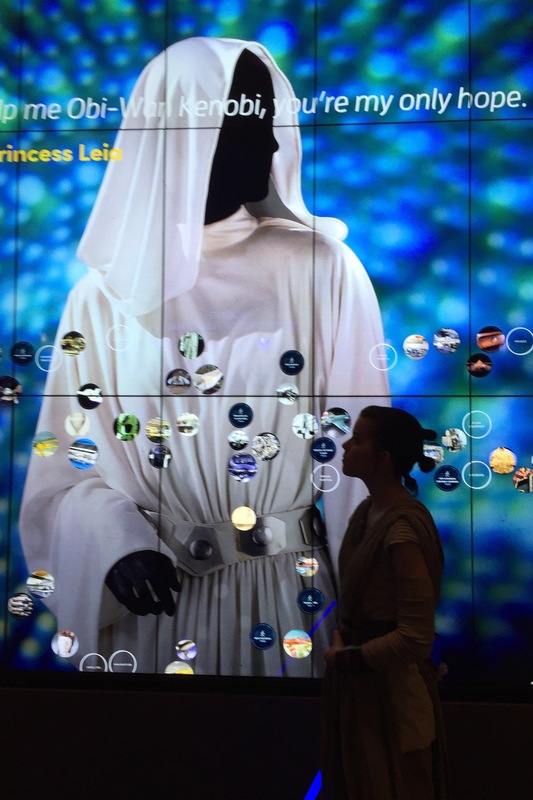 One of the Lucasfilm executives warned her that they’d “not been successful in making merchandise for women in the past.” So she was determined that there was a need from her Star Wars events, and Internet research on attendance at conventions which showed a lot of female fans attended them. Then she set out to figure out how to provide for their needs. That’s part of the pleasure of reading It’s Your Universe. Eckstein gives many details of what it took to make her realizations into a success. Her company, Her Universe, started small, selling clothing at conventions and online in 2010. 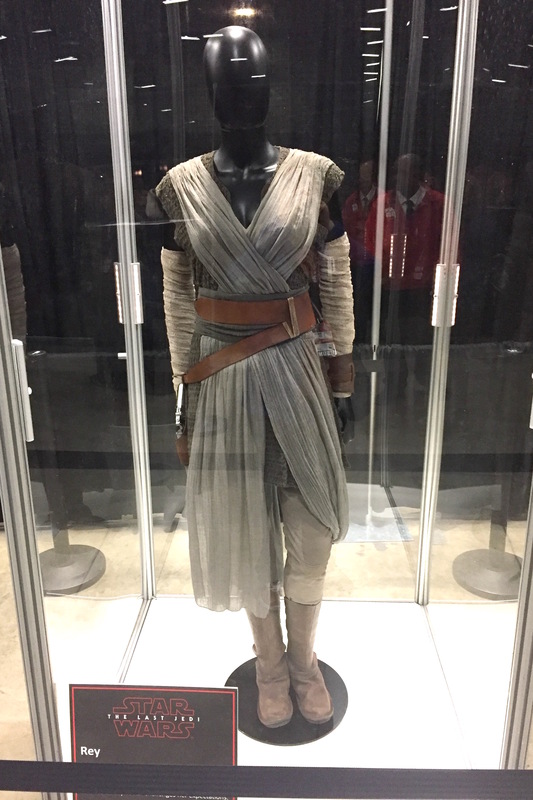 Her sales showed that there was an underserved market for merchandise aimed women and girls in media fandoms. 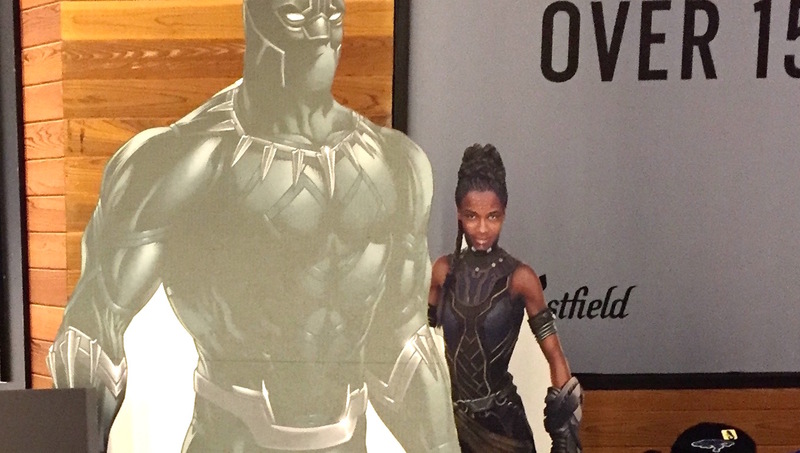 They joined forces with the store, Hot Topic, which in 2016, Her Universe was bought, with Eckstein remaining in control of the brand. Eckstein’s perky tone and Disney inserts in It’s Your Universe make the book easy reading for younger readers, and their parents. It’s a story with serious undertones. Stripping away the writing aimed at young women, this is the story of a woman saw a need (fangirls being neglected by the marketers), did the research on how to answer the need, and made the connections necessary to built a brand and a safe place for fangirls. It’s Your Universe might be a good book to read with your children. Highly recommended for 7-12 girls.